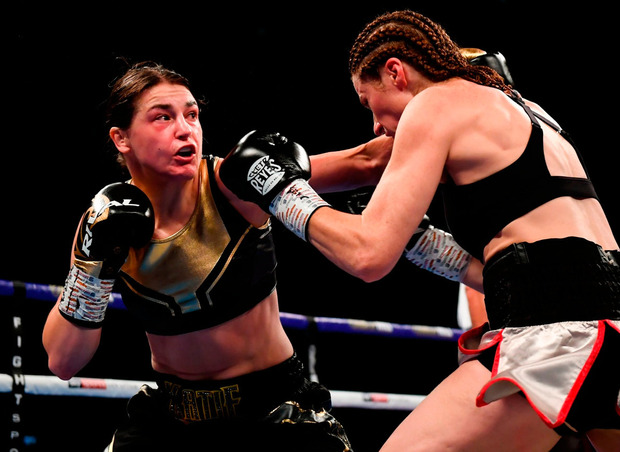 Katie Taylor will defend her two world boxing titles for the second time in three months when she takes on American Cindy Serrano in Boston's TD Garden on October 20. As details of her eleventh professional fight were announced last night, the Bray pugilist was endorsed by one of the iconic figures in boxing. Laila Ali, daughter of the legendary Muhammad Ali, said in an instagram message how Taylor constantly inspires her. Laila, one of the pioneering figures in women's professional boxing, who retired undefeated in 2007 having won world titles at super middleweight and light heavyweight, wrote: "One of the new women in the game who constantly inspires me, and I know she's going to be amazing, is a young girl named Katie Taylor. She won the Olympics and now she's pro and representing women's boxing so well." In her third professional fight on US soil, Taylor defends her WBA and IBF world lightweight titles against Serrano, the former WBO featherweight world champion. The 36-year-old Puerto Rican-born, Brooklyn-based boxer is an older sister of five-weight world champion Amanda Serrano - who will almost certainly be a future opponent for Taylor. While Amanda Serrano (29) bids for a sixth world title earlier next month, Cindy has been relatively inactive in the boxing ring. Having won the WBO's version of the world featherweight title in December 2016 on a majority decision, she only defended the belt once, five months later, and is no longer recognised by the WBO as their champion in the 126lb division. Her most recent fight was in October of last year in New York, when she secured a split decision win over Hungarian Edina Kiss. Even though Serrano will be moving up another weight division to challenge the Bray native, she has previously fought in the lightweight division, winning a Universal Boxing Federation belt in the 135lb category in 2013. She does hold the edge over Taylor in experience, winning 27 of her fights - ten via knock-out, losing five and drawing three. The contest will be shown live in the US on Matchroom's new streaming TV network DAZN, but Sky Sports will continue to screen Taylor's fights on this side of the Atlantic. Matchroom aim to turn the TD Garden, home of the Boston Celtics, into a sea of green as there are two other Irish boxers in action on the card - James Tennyson and Niall Kennedy.